This article is a short summary of Super Smash Bros. Ultimate. Super Smash Bros. 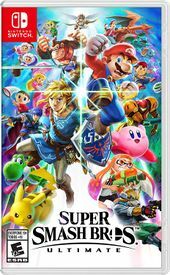 Ultimate is a fighting game and the fifth installment in the Super Smash Bros. series, released for Nintendo Switch in December 2018. Having trouble choosing a stage? Then select the Stage Morph option to transform one stage into another while battling–a series first! Plus, new echo fighters Dark Samus, Richter Belmont, and Chrom join the battle. Whether you play locally or online, savor the faster combat, new attacks, and new defensive options, like a perfect shield. Jam out to 900 different music compositions and go 1-on-1 with a friend, hold a 4-player free-for-all, kick it up to 8-player battles and more! Feel free to bust out your GameCube controllers–legendary couch competitions await–or play together anytime, anywhere! A Nintendo Switch installment in the Super Smash Bros. series was initially revealed with a teaser trailer during the Nintendo Direct on March 8, 2018. Series creator and director Masahiro Sakurai confirmed that he was working on the game soon after the trailer premiered. The game was finally unveiled during Nintendo's E3 2018 presentation. The initial proposal for Super Smash Bros. Ultimate was completed in December 2015, while the team was still working on DLC for the previous games. Development for the new title officially started in February 2016. officially started in Bandai Namco was once again contracted to develop the game, with much of the staff that worked on Super Smash Bros. for Nintendo 3DS / Wii U returning. For this installment, the team chose to build off of what was already established in the previous title rather than completely overhauling the game systems. Super Smash Bros. Ultimate will be receiving additional content post-launch in the form of five "Challenger Packs", which will each include one new fighter, one new stage, and several music tracks. These add-ons can be purchased individually, or as a singular "Fighter Pass". As a bonus for purchasing the Fighter Pass, players will receive the Rex Wig and Rex Outfit as Mii Fighter costumes. As a special offer, players who pre-purchase the digital version of the game or register the physical version for My Nintendo Gold Points before the end of January 31, 2019, will receive a free download code for the playable character Piranha Plant. This character will be released as paid downloadable content in February 2019, as separate content from the Fighter Pass. ↑ 1.0 1.1 桜井 政博 on Twitter (March 8, 2018). Retrieved March 9, 2018. ↑ 2.0 2.1 Super Smash Bros. Ultimate - E3 2018 - Nintendo Switch. Nintendo (YouTube; June 12, 2018). Retrieved October 14, 2018. ↑ 4.0 4.1 4.2 “Smash is Special” COMPLETE Translation. Source Gaming (July 2, 2018). Retrieved October 14, 2018. ↑ Super Smash Bros. Ultimate Development Started In 2016. NintendoSoup (December 11, 2018). Retrieved December 11, 2018. ↑ 6.0 6.1 Super Smash Bros. Ultimate Direct 11.1.2018. Nintendo (YouTube; November 1, 2018). Retrieved November 1, 2018. This page was last edited on 4 March 2019, at 19:15.